High quality, efficiency and consistency are defining characteristics of a successful organization. Design of experiments is the most effective methodology to achieve these objectives. Classical contour and sweet spot plots are point estimate predictions with no estimation of the probability in fulfilling the specification. 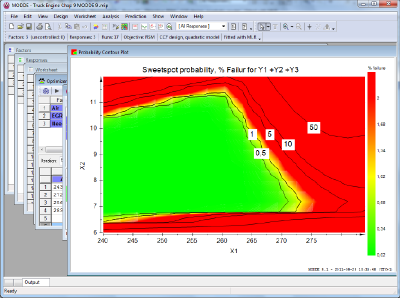 The new Probability Contour Plot displays the estimated probability of failure, at the specified risk level. This Design Space region, where all specifications are fulfilled, is displayed with a probability estimate. Introducing a novel approach for Design Space estimation (DSE) and validation MODDE 9 takes a quantum leap towards fulfilling the objective of the Quality by Design (QbD) paradigm. Based on Monte Carlo simulation, MODDE 9 rapidly estimates a safe region of operability in which the desired response profile is realistically met. The interactive DSE interface provides a comprehensive overview of the search results and enables on-the-fly adjustments of response desirability’s and factor ranges. New excellent presentation graphics for contour and surface plots is introduced. Can be customized to suite your specific presentation needs. The interactive Analysis Wizard guides you from raw data analysis to final model diagnostics and interpretation. This was possible with previous MODDE versions but we have made it simpler and intuitive to set up unique models for each response. The advantage is better predictions and more reliable interpretation of the response surfaces as they will be based on the most correct models for each response.